The beautiful Best of Show sterling silver Tiffany ASWA Jefferson Loving Cup stands atop a table in the U.S. House of Representatives’ Energy and Commerce Committee Room, Rayburn House Office Building, awaiting presentation during the annual VWGA/ASWA Atlantic Seaboard Wine Competition awards and tasting reception on Capitol Hill. Framed certificates of other competition winning wines and wineries to be presented are in the background. 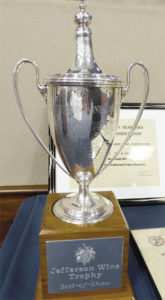 The ASWA’s sterling silver Tiffany-produced Jefferson Loving Cup and Wine Trophy has been awarded since 1982 to the winning wine and winery of the annual Virginia Wine Competition, which was conducted by the Vinifera Wine Growers Association (VWGA), the precursor to the Atlantic Seaboard Wine Association. Each winning wine and winery of the VWGA/ASWA-conducted wine competition over the past 36 years has been hand-engraved on the cup itself or machine engraved on a plaque attached to the cup’s wooden base.